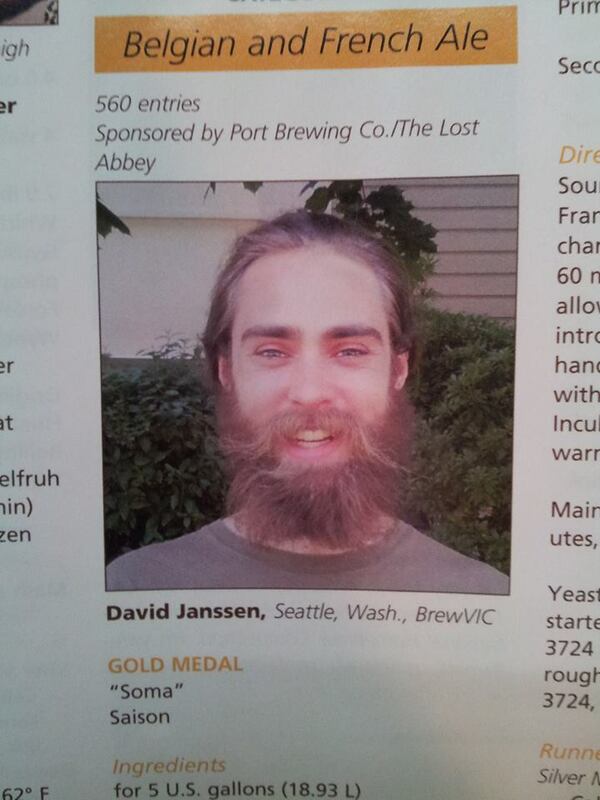 This is the recipe for my saison that took 1st place at the final round of the National Homebrew Competition in 2013. In many respects the recipe is similar to the beer I entered for the first round (which snuck me into the final round by placing 3rd in the Seattle regional judging center), but I feel that the final characters of the two were very different. I much prefer this version and it seems to have worked out well for me. The key difference between these two beers is the yeast strains, but there was also a bit of influence from the pre-fermentation wort treatment. I feel that one of the defining character of this recipe is the use of a blend of Wyeast 3724, the notoriously finicky Belgian Saison yeast strain, and 3711, the attenuation workhorse French Saison yeast strain. The idea originally came to me from (the unfortunately short lived) Odonata Beer Company saison, which I thought was pretty solid. Some details of the Odonata saison are discussed in this Brewing Network podcast (check about 1 hour and 36 minutes in for the yeast info). I prefer the flavor of 3724 but the reliable and extremely high attenuation of the 3711 strain really helps out saisons. So I think a blend of the two, favoring the 3724, is a great idea. And I know of at least one other commercial brewery out there doing this now. A blend of Wyeast 3724 Belgian Saison and Wyeast 3711 French Saison. Roughly equivalent to 2 vials/smack packs of yeast and the blend was something on the order of 70% 3724, 30% 3711. I had starters of each going and poured off from at high krausen. In subsequent saison batches I've let the starters ferment out and cold crashed them, and then split into patchable amounts in mason jars in the fridge. I either blend the strains at this point or blend at pitching. I prefer blending cold yeast slurries (either before storing or at pitching) because I think it gives me better control of the pitch rate. And I like to grow up the two strains in individual starters to allow me versatility in using the strains individually and to control the blend proportions. In the future I'd like to experiment with repitching the blend but for now this is easier and the results are reasonably consistent. The base water profile for Victoria is a Pilsen/nearly distilled oriented water. Sour Mash- Pils comprising 10% of the total grist was sour mashed for ~24 hrs. I did a standard sacch rest (~152-154F) with the sour mash portion for 60 minutes. Then I raised the temp to 170F and let it cool to 120F with minimal mixing to keep out O2. At 120F I added ~1/3 handful of acidulated malt and ~1/3 handful of Franco-Belges pils to inoculate with lacto. A lower pH and the absence of O2 helps a sour mash be successful and avoid gnarly off flavors. I sealed the top right at the liquid line with saran wrap to keep out O2. Then I floated the sour mash pot in a rectangular cooler with hot water and a floating dairy thermometer to watch temps. I would regularly pull water out of the cooler, boiled it and added it back to the cooler to keep the temp between 100F and 120F. The temp would definitely drop overnight and while I was at work, but I was able to keep it in this range well enough. It was a bit of a pain overall and I tried this sort of thing with acidulated malt to achieve a similar acidity, but it was missing complexity and the mouthfeel wasn't as good. In future sour mashed batches I may let it go 36-48 hours. If the mash gets too sour you can always add only a portion of it. I added the sour mashed wort to my main mash runnings by pouring the pot with my mashed grains (and inoculation grains) through a large grain sack, the sort you would use for steeping and brew in a bag. Soma 2 step infusion mash. Main Mash- 2 step infusion. 45 minutes at 147F, and 20 minutes at 153F (see graph). I mash in a 10 gallon stainless pot with a false bottom. The advantage of this is that I can heat my mash with my burner. The disadvantage is that it doesn’t hold temperature super well so I pretty much always have to heat my mash at least once, especially in winter. 2 hrs. Was planning on 90 minutes but my gas tank ran out in the middle and as a result the boil was weak for a reasonable length of time, so I added 30 minutes to hit my target gravity and volume. Hops were added 30 minutes (0.75 oz Saaz, 1.25 oz Hallertau), 5 minutes (0.5 oz Saaz, 0.75 oz Hallertau) and 0 minutes (0.75 of Saaz, 1 oz Hallertau) left in boil. Most of my saisons follow this backbone grist and hopping regime. I prefer hoppier saisons, and as it is a relatively low IBU style I like to derive all of my bitterness from ‘flavor’ and/or ‘aroma’ additions. The graph at right details the fermentation schedule. I pitched at 68F and kept the beer at 68 for the first day, then raised to 80F over the following 2 days. I held it at 80F from day 3 until day 9, then the temperature was smoothly lowered to 71 by day 11. Finally I chilled it reasonably quickly to ~58F until bottling. I racked to secondary after 15 days. This was more out of needing to free up a carboy than desire to do a secondary, and I usually avoid transfer to a secondary (and advocate that others do so as well) in a beer of this nature (meaning no long term bulk aging). I controlled fermentation temperature with an aquarium heater in a tub of water. I like this method as it gives me good control of temp throughout fermentation by simply turning the dial on the heater and the water bath acts to cool the beer temp if fermentation is producing too much heat. I don't have to worry much about cooling the beer more than that. As it was winter and I like the cold, the conditioning temp between active primary and bottling was the ambient temp of my room (58F). There was one month between brew day and bottle day. I primed the beer to ~2.7 volumes of CO2. My experience with 3711 leads me to believe that this yeast slowly works on more complicated sugars over time so carbonation probably was more like 3+ vols. I’ve talked to commercial brewers and yeast company folks about this and have heard mixed answers. Whatever the case, 3711 attenuates REALLY well and even if I let a beer finish out, over time in the bottle the carbonation seems higher than what I primed it to. There was about 5 months between brew day and judging day (4 months between bottling and judging). I set aside bottles for judging in the fridge for about the last 1.5 months before shipping the beers to Philadelphia. It probably took about 1.5 months in bottles before the beer was where I wanted it to be. I’ve noticed that with a number of my saisons, even when I condition them relatively warm, it takes a good bit of time in the bottle before the beer is where I want it to be. And many of them throw off diacetyl in the early stages in the bottle. So a saison that is diacetyl free at bottling might have diacetyl and near-final carbonation at 2-3 weeks and then will have no detectable diacetyl at 4-6 weeks. This isn’t always the case, but I do see it happening fairly often. Here's a writeup of how I now grow up yeast for blending. March 2016 update: Here is a discussion about this recipe from the Milk the Funk facebook group. I mention things like what I'd do differently now and there is good general discussion of topics like yeast blending and how much acidity this approach can give. I really enjoy your blog, Dave and have learned a lot. I brewed this roughly based on your process and it turned out to be one of the best saisons I've made. Looking forward to brewing it again! Cheers! Thanks Eric! I'm glad you're finding the blog useful and you were happy with the saison! Dave, I just discovered your blog after the last episode of basic brewing. I find that my beers with 3711 always feel overly bitter (even at 25 ibus and og around 1050). Any tips on maintaining balance while hopping over 20ibus and finishing so low? Hi Michael, thanks for checking out the blog and listening to that BBR episode! I have a couple ideas on this but I'm not sure that I have an absolute solution. To start I haven't brewed with 3711 as a solo yeast in a long time so I my personal experience with only 3711 is limited and dated. On to some ideas. -Hopping schedule: I tend to hop my beers with a 'bittering' addition with around 30 minutes left and a finishing addition as a whirlpool for ~20 minutes, or maybe a boil addition in the last 5 min. I split the calculated IBUs (Tinseth formula, using Beersmith) fairly evenly between my 'bittering' and finishing hops. I know this bittering addition is much later than typical but I like how it shifts the balance toward hop flavor over hop bitterness. When I hop to similar theoretical IBUs but with a more classic bittering addition I like the beers less, partly because of more bitterness that I am not happy with. I think two factors are at play here. One being that my extraction could very easily be different from the calculations and the longer boil hopping route could give me more IBUs than I think. The other is that with a balance toward hop flavor, I notice the bitterness less/expect it to be there so I perceive it to be more in balance. The beer has more hop flavor so it can get away with more bitterness. So perhaps you could try shifting toward later additions for the same IBU to see if that helps. -Hop choice: I typically use noble or noble-type hops and I like the character they give. Scientific studies don’t support the idea that cohumulone is more bitter/more harshly bitter than other alpha acids, but the collective experience of many great hoppy beer brewers also says something is likely going on, even if the acid itself in isolation and identical concentrations isn’t more bitter. Cohumulone is slightly more soluble, so perhaps extraction is a bit higher from high cohumulone hops, resulting in a bitterness that is perceived as more harsh (when in reality it is just higher). Maybe something else is at play. But it could be that the hops you are using are contributing to the bitterness perception not being what you want. -FG: Finishing at such a lot FG can accentuate bitterness and this may be part of the problem. Solving this by increasing the FG with 3711 might be tricky as that yeast doesn't tend to do that so well. It's too good at attenuating. But whether or not 3711 is used in a blend should be a bit irrelevant here as it would still attenuate well in a blend. I don't really notice this issue as much so either this is a taste preference difference or something else other than FG is contributing to the bitterness you are finding. So the point of all that is that raising the FG a bit might help decrease the perception of hops, but that might also not be the way you want to do this/may not be the primary contributing factor. -Something in the 3711 flavor profile: I do find something in 3711 beers that can contribute a harshness/accentuate harshness). I don't know exactly what it is. Maybe an alcohol thing, or a spice thing, or a slightly elevated perceived tartness. I'm not sure but I know I've gotten it and I don't think this is hop derived. So trying the same recipe with another yeast may help (maybe even a split batch). But if you're locked into 3711 for whatever reason then let’s ignore this option. Ok, that’s a pretty good place to start to try to troubleshoot. If the difference is not down to subjective preferences in bitterness then I know this problem can be solved! There are some great saisons out there with more than 25 IBUs. Hope this helps! Feel free to ask discuss more and let me know how solving this goes if you try some of these or other ideas!